There are 12 main rest camps situated in different areas of Kruger Park which enables visitors freedom of movement to explore the reserve. The original term "rest camp" is misleading to most overseas tourists & implies a rather basic or temporary facility. In fact, these rest camps are permanent structures similar to small resorts providing comfortable African style chalets, licensed restaurants, shops & other features. We choose overnight camps according to availability & our knowledge of conditions. There are different types of accommodation including standard chalets, luxury riverside chalets, family cottages, furnished safari tents or economy huts. National Parks usually refer to these African chalets as bungalows. Upgraded chalets, riverside chalets & family cottages have limited supply so depend on availability on the dates required. Clients should request these as early as possible & check for additional cost. Each of the main rest camps is fenced off to prevent dangerous animals entering & guests must remain within the camp from dusk till dawn. There is a restaurant, shop & a swimming pool. Mobile phones should pick up a signal but otherwise there are no telephones in the chalets. 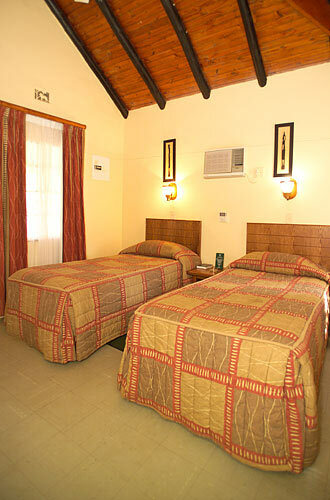 Chalets are serviced daily, air-conditioned, equipped with bedding, towels & have a private shower, toilet & basin. Guests are supplied with a front door key & insect screens are fitted to the windows. Most chalets have a small patio with a table & chairs plus a refrigerator. Standard SA 220v electric sockets are fitted to rooms & adaptors for charging videos or mobile phones are available from the shop. Our safaris include DBB (dinner, bed & breakfast) on the nights we stay inside Kruger Park. 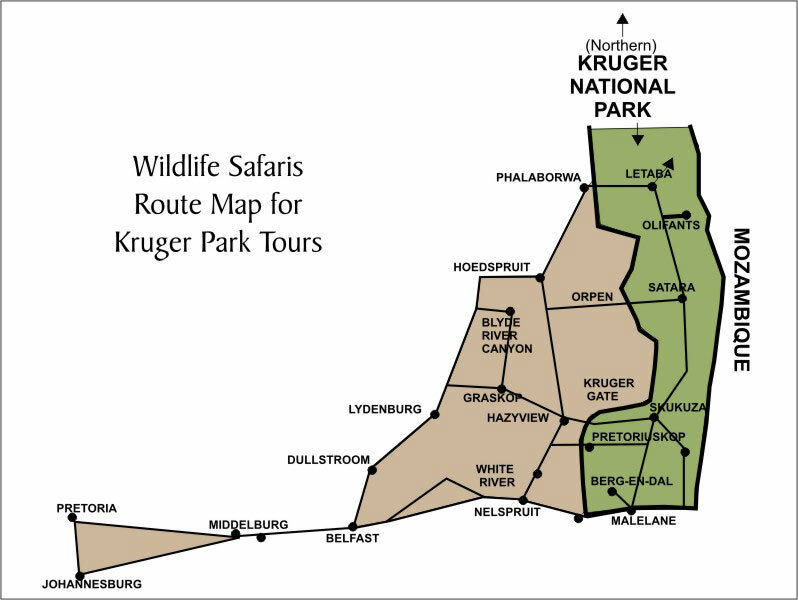 Kruger Park Camps are selected according to availability and location for each itinerary. We reserve chalets once Clients have made the first payment and they are usually situated in southern or central Kruger. WiFi is not always available, so check with your guide. Berg en Dal - just north of the Crocodile River and near Malelane entrance gate. Crocodile Bridge - a small camp without a restaurant near the Crocodile River. Lower Sabie - very popular Camp overlooking the Sabie River with Mugg & Bean restaurant. 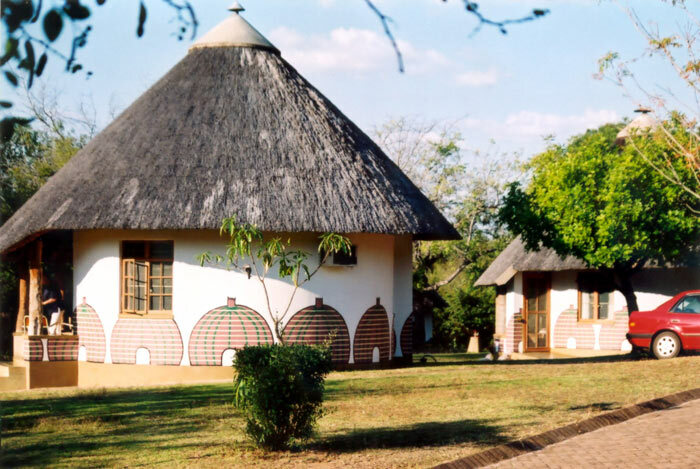 Orpen - a small camp situated at Orpen Gate in central Kruger � self catering only. Pretoriuskop - historical Camp near Numbi entrance gate with a natural swimming pool. Satara - in the open plains of central Kruger - no real water feature. 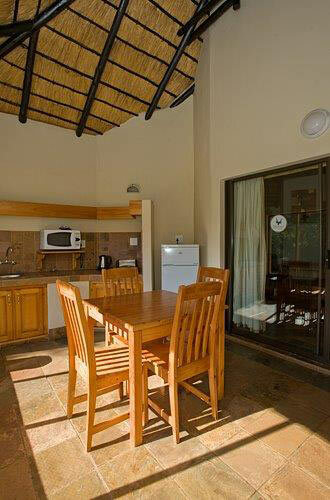 Skukuza - overlooking the Sabie River and upgraded for tourists with the Cattle Baron restaurant. 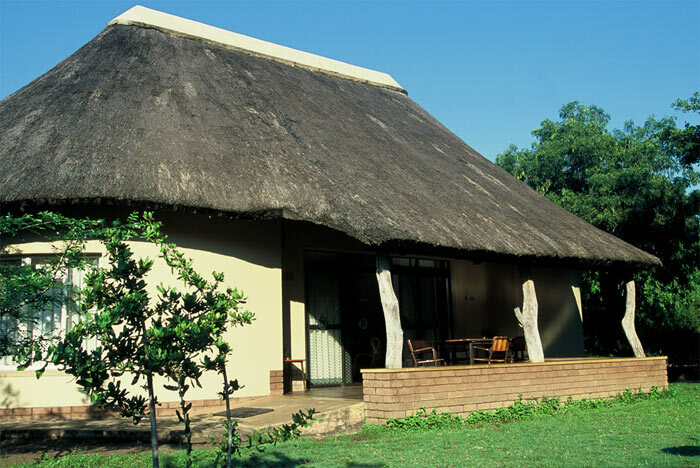 Sabie River Bush Lodge is a privately owned lodge bordering Kruger Park. 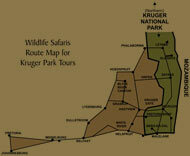 It is our second option at times when all the above Kruger Park Camps are full. We have good reviews for this lodge and our guides find the rooms, outdoor restaurant and especially the view from the deck makes it a very popular choice. 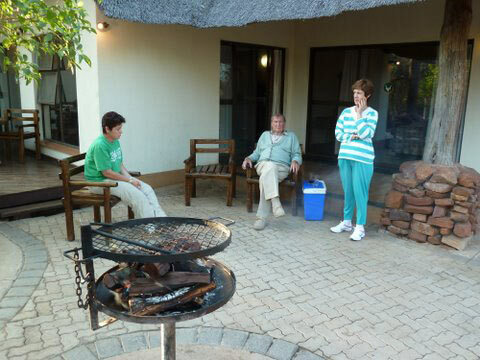 The hospitality at this private lodge is superior to most Kruger Park Camps. 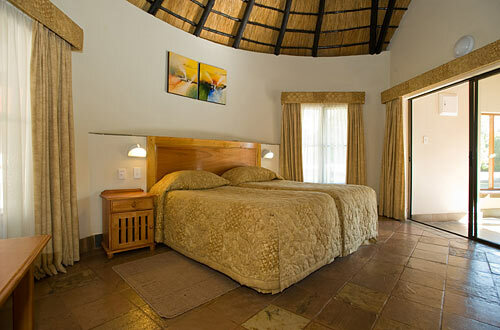 Standard Chalets - usually round (rondavel) with a thatched roof, single room , 2 or 3 separate beds & en suite shower / toilet. These rooms are reserved for couples (double) , 2 friends (twin) or families (triple). Mostly graded 3 stars. Upgraded Chalets - These units are superior to standard chalets & provide more comfort . They are suitable for double or triple occupancy, en suite, equipped with aircon, possibly TV, better soft furnishings & a refrigerator. Ask your sales consultant to check availability & the additional cost. Riverside Chalets - round thatched chalets situated along the river frontage & have a more modern design with sliding glass doors so that guests can enjoy the view as well as animals coming to drink. They have 2 separate beds pushed together, quality decor, much larger modern bathroom, TV with limited channels plus upgraded lighting & air-con. There is a patio, outdoor furniture & a refrigerator. Not officially graded but equivalent to 4 stars. These particular chalets are situated at Skukuza, but other camps such as Lower Sabie & Satara will soon be providing superior chalets. Family Cottages - contain 2 or 3 bedrooms with double or twin beds to suit family groups & private shower/ toilet facilities. There is a kitchenette, a patio with furniture & a refrigerator. Mostly graded 3 stars. Furnished Safari Tents - these are permanent canvas tents built on a wooden platform. They have 2 beds with linen, towels, a cupboard, table, chairs, electric fan & a refrigerator. Communal ablution facilities are available nearby. These are less expensive than standard chalets & suitable for economy safaris. Economy Hut - one room with 2 beds, basic linen, towels, chair, simple air-con or electric fan & use of communal ablutions nearby. Suitable for students & economy safaris. Not officially graded but less than 3 stars. Riverside chalets add ZAR 550.00 per chalet per night in Kruger. 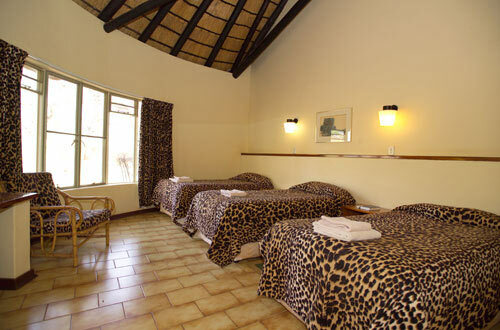 Upgraded chalets add ZAR 350.00 per chalet per night in Kruger. Triple share in standard chalet – ask about discount for third person. Economy tent or hut less less ZAR 550.00 per tent per night in Kruger. 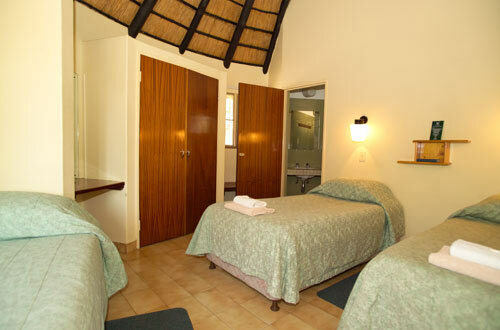 Economy accommodation can only be arranged in Kruger Park Rest Camps & not for nights spent at private lodges or hotels. Instead of a standard chalet with private shower, toilet & air-conditioning, we can request a cheaper hut or furnished safari tent using public bathrooms. This is not ideal in the summer months when its hot & humid making insects more common. It is also not recommended for families with children under 12 years. Please discuss these options with the sales staff when planning your safari. Clients choosing economy accommodation will enjoy exactly the same game drives as other passengers. 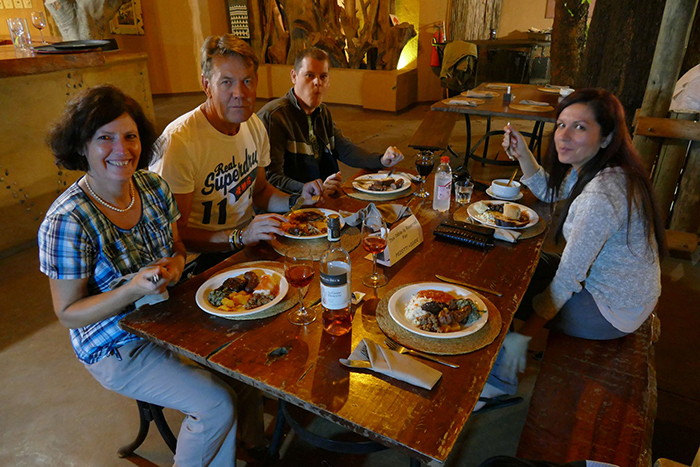 South African National Parks has decided to introduce popular family restaurants at Main Camps in Kruger Park. Mugg & Bean opened at Lower Sabie in 2014 whilst Skukuza has The Cattle Baron. Restaurants have been refurbished & modernised so passengers can look forward to better meals & improved service in Kruger. Often our guides visit Lower Sabie for breakfast & the restaurant is in a wonderful spot overlooking the Sabie River. During the dry season you can expect to see plenty of hippos and crocs as you sip coffee. Dinner each night will be in a Camp restaurant or your guide may plan a barbeque. 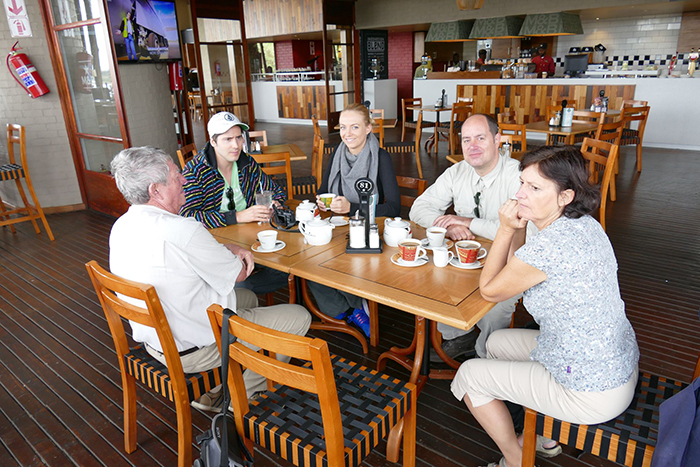 Lunches in Kruger are available at the Deli Café - at passenger's expense. Camp shops sell groceries, soft drinks, alcoholic drinks, books, maps & curios. It is possible for vegetarians to find suitable meals in Kruger, but please advise us when booking.